The Rite of Spring [31:16]. 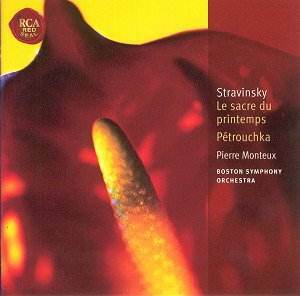 While Monteux�s Petrushka is an old friend this was my first experience of his Rite. Monteux conducted the premières of both works, as well as that of Ravel�s Daphnis et Chloë, but, while his recording of the latter is a classic of the gramophone and his Petrushka has always been well-liked, I�ve never seen his Rite placed at the top of anybody�s list. I had rather assumed that the poor old chap was coping manfully with something a bit beyond him, something which needed a new generation of conductors to come to terms with it. I�m happy to relate that it isn�t like that at all, but let�s begin with Petrushka. Back in the days of LP I had this recording and Stravinsky�s own and I have to say that Stravinsky�s recordings of his own music were my personal point of entry into the world of a composer who perplexed me by his apparent changes of direction, as he perplexed many who grew up in the days when he was still a living legend . There seemed to many of us at the time that there were three Stravinskys (at least) with no point of contact between them. It was Stravinsky himself who convinced me that all his work, early, middle and late, came from one man. Wherever you turn in his recordings you find that volcanic Russian energy which courses through The Rite of Spring but also (in his hands) through the neo-classical works to the later serial ones, as well as those echoes of inexorably plodding cortèges, his inheritance from the Orthodox Church, which are at the root of much of the Rite, but also (again, in his own hands), of such moments as the Coachmen�s Dance from Petrushka, the Symphony of Psalms (fairly obviously) and even many of the neo-classical works � Pulcinella for instance � which other conductors treat as ear-tickling charmers. But, having long ceased to worry about the "three Stravinskys", I�m not sure that the comparison doesn�t go the other way now. Even in my youth I had to admit that Monteux was more communicative, more of a story-teller. I was partly influenced by the fact that, while Stravinsky�s recording sounded reasonably well in its LP form and on the equipment I then had, I spent a lot of time twiddling knobs to try and bring the Monteux into decent focus, and got very frustrated since, having got one section to sound better, I had to start twiddling again a few minutes later. So all thanks to the remastering engineer, Andreas Torkler of Sonopress Studios, Gütersloh, Germany, for having revealed a recording with both bloom and brilliance, remarkably good for its date. And what an artist Monteux was! His opening scene is a mite slower than Stravinsky, and this enables him to produce a range of orchestral colour, of affectionate phrasing and balletic lilt. Its heady amalgam of Rimsky-Korsakov and late-Debussy once seemed un-Stravinskian, but now it seems a blueprint for performances by such conductors as Dutoit and Abbado who grew up when this music was already established concert fare. So what of the Rite? Firstly, while his earliest recordings found the orchestra, if not the conductor, groping for the notes, with the help of the Boston Symphony Orchestra which was welcoming back a man they all adored but who had been forbidden to mount their podium during Koussevitzky�s long reign as a result of the latter�s professional jealousy, this is a performance where the sparks frequently fly. Maybe there isn�t quite the whip-crack precision in "Mock Abduction" which we have heard from Boulez, but there is vivid characterization and, in the matter of tempi, this is a performance which needs to be studied carefully. As often with conductors of an earlier generation, slow tempi tend to be less slow, and (but more marginally) fast tempi tend to be less fast than we usually hear now. The opening is almost disconcertingly swift, but a refreshing antidote to some of the more lugubrious evocations we often hear. The same can be said of the opening of Part II, where something of mystery is perhaps lost in favour of flowing, balletic movement. Most notable of all are the final two tableaux, which have often been spelt out too deliberately, primevally timeless maybe, but lacking in impetus; no danger of that here as, with percussion well to the fore, the Ancients crowd impulsively upon their victim. Altogether, an enthralling, colourful and frequently fearsome Rite. I didn�t look at the recording date until afterwards and quite frankly, I would never have guessed it was over fifty years old; it really is extraordinarily good. Whether it always sounded so good I have no idea, but it sounds like one of the classic Rites to me � and recorded in a single day! If you want bargain versions of these scores and don�t insist on having them labelled DDD, don�t hesitate. If, like me, you are interested in classic performances from the past, then don�t miss these finely remastered accounts.